This morning we visited Auschwitz I, the most visited site in all of Poland. What was once the center of the massive three-camp Auschwitz complex was reclaimed by the Polish government and turned into a museum in 1947, just two years after Russian soldiers liberated the camp. 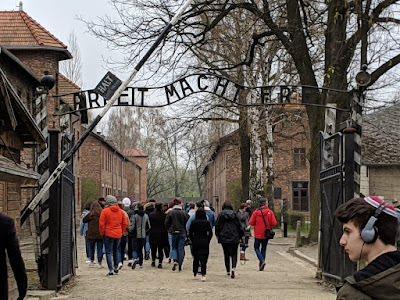 We began by walking through the famous "Arbeit Macht Frei" entry gate, yet another example of the Nazis' use of deception to keep prisoners in line. The museum's strict rules dictated that, for the first time all week, Rabbi Lubner would not be our tour guide. 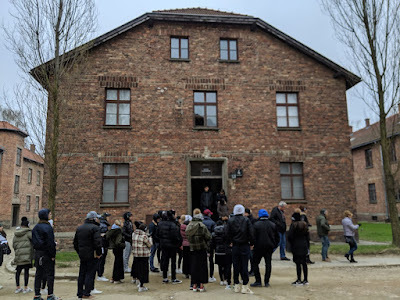 Instead we were led through the camp by a non-Jewish, Polish guide, and it was fascinating to hear tales of the Holocaust from his perspective. He even talked about which exhibits were most memorable to him when he first visited Auschwitz on a school trip as a boy. This part of Auschwitz mainly housed non-Jewish Polish prisoners, but many of the museum's exhibits are dedicated to telling the story of the 1.1 million Jews murdered at Auschwitz. We were moved by displays of personal items confiscated from Jews upon arrival - thousands of eyeglasses, hairbrushes, and even prosthetic limbs. The most disturbing was a massive display case of 2 tons of human hair collected from approximately 40,000 of the hundreds of thousands of women who were shaved upon arrival. The rest of the day was spent traveling back to New York. We are all glad to be back home and reunited with our families and our beds, but every one of us was moved and changed by the many things we have seen, learned, and experienced over the past few days. Special thanks to Mrs. Winkler for coordinating, to Mr. Hofstetter and Ms. Dweck for chaperoning, and of course to Rabbi Lubner for everything he did to make this such an extraordinary and meaningful experience.